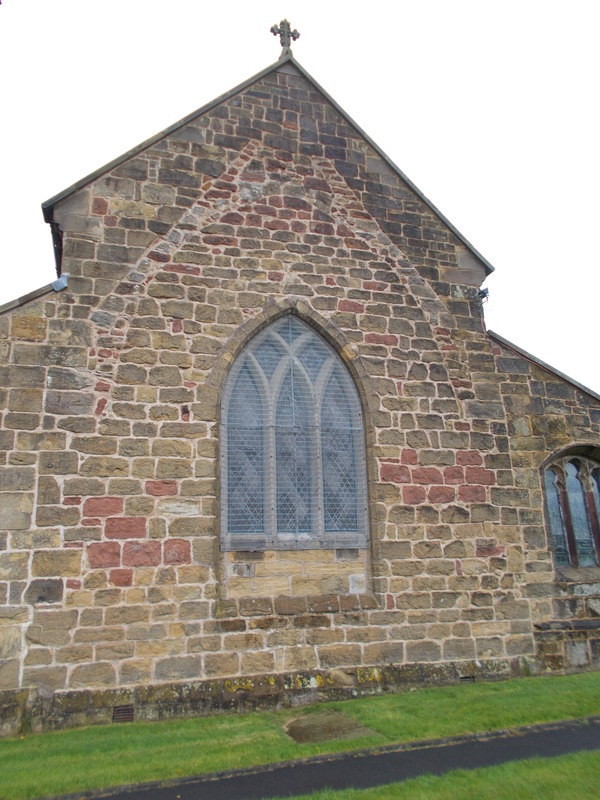 The shape of the first small medieval building can be seen in the outside walls of the church today, as the lowest outline of brickwork (see photograph on the left). The red and yellow sandstone clearly show the earlier and later stages of construction. The church was served by Cistercian monks from Stanlaw Abbey, who later relocated to Whalley. They owned land and collected tithes within the Samlesbury area. During the Anglo Scottish wars Robert Bruce attacked both the church and Samlesbury Lower Hall in 1322. A huge oak drawbar was used to bar the entrance against such attacks and can still be seen today behind the main door. 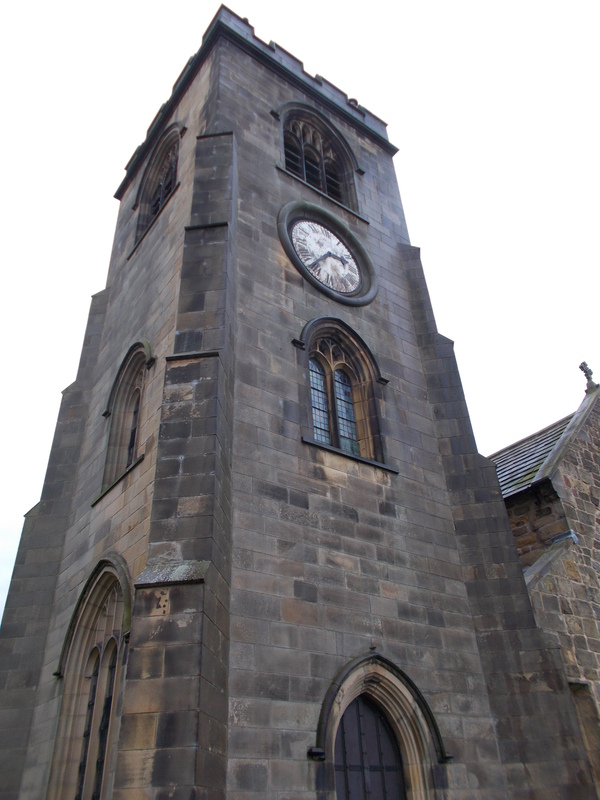 A similar one exists at St Leonard’s Church in Middleton (see our page here). Many of the high status homes in Lancashire were fortified against such threats, such as the towers of Hoghton, Radcliffe and Turton. The church’s fortunes ebbed and flowed over the years. In 1552 Edward VI commissioners seized many of the religious ornaments in the building, seeing such trappings as heretical. 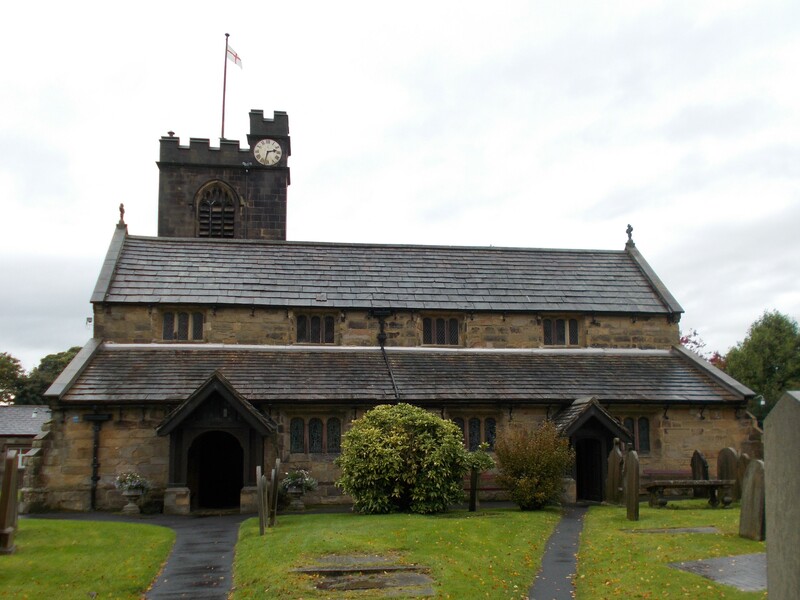 They also tried to confiscate the church’s two bells that had possibly come from Whalley Abbey. The locals protested vigorously, and the bells were allowed to remain. One of them, known as the Sanctus Bell can still be seen in the church today. During the reign of Edward’s sister, Elizabeth I, the church was restored and enlarged by the Earl of Derby, with the present north and south aisles being added. Religious turbulence continued into the next century and in 1619 parishioners were censured for ‘having piping music and dancing in their houses at divine service time upon the Sabbath day’. Other outlawed customs they were accused of included ‘burning candles over corpses … and praying where crosses are and have been’. Big internal changes occurred in the 1600s. The box pews that today dominate the inside were added and many still display the family names of their owners. The oldest is the Hoghton pew from 1678, and the latest one is dated 1756. The communion rail (thought to be a staircase rail from nearby Samlesbury Hall) and the present two decker pulpit (which was once a three decker) were also added. With the Jacobean uprising of 1715 against George I it was compulsory to display the Royal Coat of arms within a church. This shows the English lion and the Scottish unicorn, the unicorn with its crown around its neck and chained- a very visual statement. The one we see today dates from 1741. At the end of the 1700s the church was again restored with a double gallery placed at west end. This was used by children who were owned by Roach Mill Factory and part of this is still in place today. The late Victorian era saw the porch and tower added in 1889 with a Mrs. T.M. Crook of Stanley Grange laying the foundation stone. The church originally had a wooden bell turret over the west gable, but this was taken away when the new stone tower was added. Mrs. Crook donated a peal of eight bells and in return was given the medieval Sanctus Bell and a second old bell from the wooden turret. The Sanctus Bell was then used at the Grange to summon workers from the farm fields! It was later returned by a Mrs. Baxter also of Stanley Grange. It now sits within the church with a display board detailing its history. It is inscribed Campana Jhesu Christi which we translate as Bell of Jesus Christ, and is one of the oldest of bells in the county. A Peal Board commemorates the new bells being put through their paces when in 1908 the 5040 changes of ‘Grandsire Triples’ were rung in 3 hours and 2 minutes. The Lancashire Association of Change Ringers were behind this and the board includes the name of all the ringers. If you’d like to hear what Grandsire Triples sound like, and how the bell ringing order changes as the peals progress, have a look at this short YouTube video here. All the above historical artefacts can be viewed by visitors to the church today. Other things of note include the Norman font, which probably came from St Leonard’s Church in Walton le Dale. It had been left in the churchyard for many years before being restored to its present position in 1896. There are reassembled fragments of medieval glass in the west window, the window frame itself being a medieval style termed ‘Early English’. High up on one of the walls is the funeral armour of a helmet, sword and shield attributed to Sir Thomas Southworth of Samlesbury Hall who died 1546. Particularly impressive are the large painted canvas boards from the 1700s which feature The Lord’s Prayer, Creed and Ten Commandments. The exterior of the church can be viewed at any time during daylight hours and there is ample parking next to it. It is signposted just off Preston New Road and the postcode is PR5 0UE.